Located in the center of East Manhattan, Meadows Elementary School is a California Distinguished School that has demonstrated commitment to academic excellence. Last year, Meadows students scored a 10 out of 10 on the Academic Performance Index (API). Their test scores are higher each year than the statewide average. Located on the corner of Meadows Ave. and Peck Ave., Meadows Elementary caters mostly to students from East Manhattan Beach. It offers grades K through five, and has an enrollment of about 500 students. The general class size in kindergarten is about 20 students, and about 30 for the fourth and fifth grades. 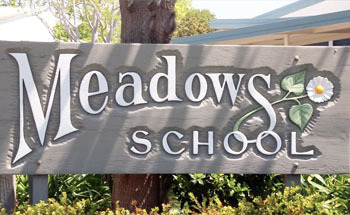 Just as in most Manhattan Beach schools, Meadows has a high level of parent involvement. Parents meet with staff as part of the statewide School Improvement Program to develop curricula and add their input to the formation of an educational plan. Parents also do hands-on fundraising to supplement the funding Meadows receives from the district and the Manhattan Beach Education Foundation. By doing so it is able to keep a variety of curricular and extracurricular programs running. Meadows Elementary School encourages students and parents to be environmentally conscious and has deemed Wednesdays a "Walk to School" day. It brings in volunteers to talk to students about nutrition and healthy living, and offers students the opportunity to plant and harvest their own produce in an on-campus garden. Meadows also offers a Young At Art program, and a unique cultural arts program that exposes students to the history, customs, and performing arts of other countries and cultures. Meadows Elementary is a great choice if you're looking for a school to provide your kids with a high-quality, well-rounded educational experience. For official information, visit the Meadows Elementary official website or the Manhattan Beach Unified School District.